Longlisted for the Women's Prize for Fiction 2018. Manhattan Beach opens in Brooklyn during the Great Depression. Anna Kerrigan, nearly twelve years old, accompanies her father to the home of Dexter Styles, a man who, she gleans, is crucial to the survival of her father and her family. She is mesmerized by the sea beyond the house and by some charged mystery she detects between the two men. Years later, her father has disappeared and the country is at war. Anna works at the Brooklyn Naval Yard, where women are allowed to hold jobs that once belonged to men who are now soldiers. She becomes the first female diver, the most dangerous and exclusive of occupations, repairing the ships that will help America win the war. At a nightclub, she chances to meet Dexter Styles again, and begins to understand the complexity of her father’s life, the reasons he might have vanished. With the atmosphere of a noir thriller, Egan’s first historical novel follows Anna and Styles into a world populated by gangsters, sailors, divers, bankers, and corrupt union officials on New York City’s wartime waterfront. Manhattan Beach is a deft, dazzling, propulsive exploration of a transformative moment in the lives and identities of women and men, and America and the world: a magnificent novel by one of the greatest writers of our time. Egan’s propulsive, surprising, ravishing, and revelatory saga, a covertly profound page-turner that will transport and transform every reader, casts us all as divers in the deep, searching for answers, hope, and ascension. Splendid…the novel is tremendously assured and rich, moving from depictions of violence and crime to deep tenderness. The book’s emotional power once again demonstrates Egan’s extraordinary gifts. Realistically detailed, poetically charged, and utterly satisfying: apparently there’s nothing Egan can’t do. This large, ambitious novel shows Egan at the top of her game. Anna is a true feminist heroine, and her grit and tenacity will make readers root for her. Manhattan Beach is a fleet, sinuous epic, abounding with evocative details, felicitous metaphors, and crystalline historical assessments… [and] magnificently captures this country on the brink of triumph and triumphalism. Egan’s first foray into historical fiction makes you forget you’re reading historical fiction at all. While it’s obvious that Egan meticulously researched the era’s history, the novel’s crooked politicians, organized-crime bosses, and shady cops make it read like a fast-paced, hard-boiled drama. Pulitzer Prize winner Jennifer Egan makes her maiden deep dive into historical fiction with the vivid Manhattan Beach. This is a novel that will pull you in and under and carry you away on its rip tides... Its resonances continue to wash over the reader long after the novel ends. Egan works a formidable kind of magic, however. This is a big novel that moves with agility. It’s blissfully free of rust and sepia tint. This is a big novel that moves with agility. This is a novel that deserves to join the canon of New York stories. The maritime experiences of both father and daughter are often beautifully rendered, but it's the relationship that elevates the novel above Egan's earlier books. I am certain: the book in my hands is an inviolable vessel... a whole story sprung from a whole imagination. It yields a world that, with all its mystery, its shades of dark and light, its yearnings and its satisfactions, feels resplendently true. An unusually well written, well researched, emotionally satisfying page-turner. [Egan has a] talent for dazzling, specific descriptions that animate each chapter, and dialogue that rings true to her memorable characters and their era. ...she’s hit it out of the park again. This thoughtful, moving book is no less complex than its famous predecessor, offering a sunken chest of treasures for those who dare to dive. But to find a compelling story well told, one that is full of complex characters and sentences so luminous they stop you in your tracks, is one of literature’s greatest pleasures. 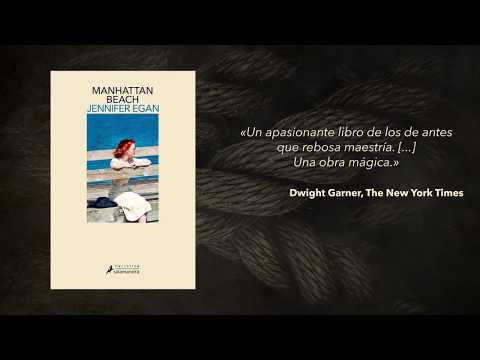 That pleasure is bestowed liberally by Jennifer Egan in Manhattan Beach. Elements of noirish thriller keep you turning the pages, only stopping occasionally to marvel at another pitch-perfect description. If Philip Roth had written Manhattan Beach, they would call it a masterpiece. And maybe it is, or close enough anyway. Shares with Egan's Pulitzer Prize-winning A Visit from the Goon Squad and an earlier novel, The Keep, a vivid apprehension of the provisionality of human life and the onus on fiction to dispose itself accordingly in the attempt to capture it.